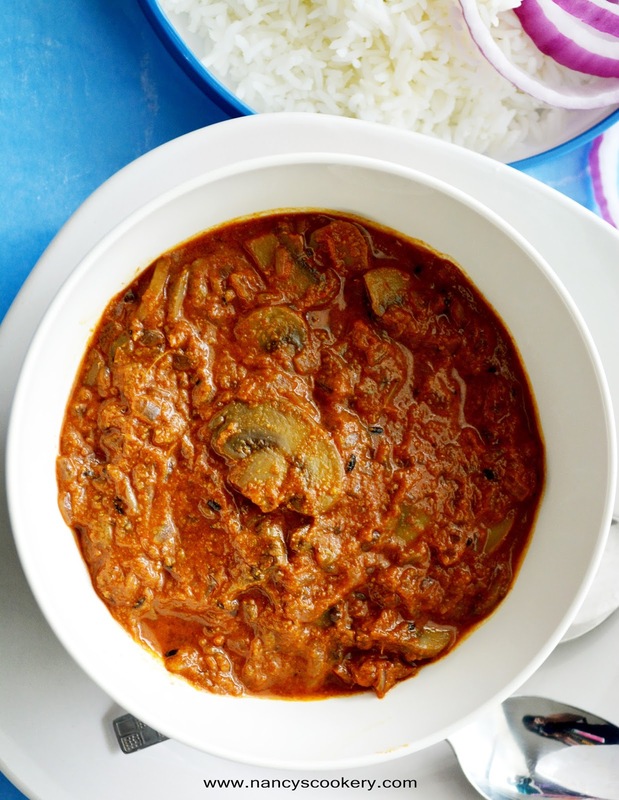 Mushroom gravy is prepared from mushrooms, onions, tomato and some Indian spices. The ingredients list may look big but most of them are the tempering items with some ground paste of ginger garlic and tomato. This mushroom gravy suits well as side for rice, chappathi, parathas, veg and non-veg biryani and all types of pulao. Mushrooms are the only fruit or vegetable that contains Vitamin D. Mushrooms are also rich in antioxidants like carrots and red bell peppers. It has selenium which protects against cancer and reduces tumors. Mushrooms are good for heart health, diabetes, immunity and also for weight management. cumin coriander powder - 4 to 5 tbsp. Ajwain seeds - 1/4 tsp. Cardamom - 6 to 7 no. Heat oil in a skillet and saute the items given under 'To Temper' heading without burning it in medium flame. Add onions to it and saute until the onions are browned but not burnt in medium flame. In the meantime grind the ingredients under 'To Grind' heading and ground it to fine paste by adding little water. Now add the ground paste to the sauted onions and saute everything until raw smell of the ground paste is gone /saute for 15 mins. in medium flame. Then add mushrooms, cumin coriander powder, chilly powder and salt. Mix them well and keep stirring until the mushrooms are sauteed / saute for 5 to 10 mins in medium to high flame. Now add water water to cook the mushrooms and to get gravy consistency (Add 1.5 cups of water /as required). 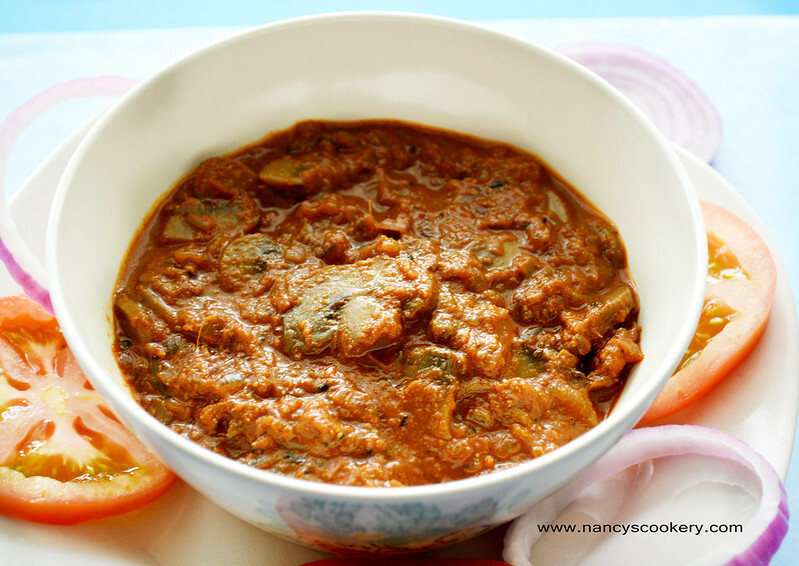 When the mushrooms are cooked and the desired consistency is reached, the mushroom gravy is ready to serve. Heat oil in a pan and add items under "To Temper" in medium flame and saute till it sends nice aroma. Do not burn the spices. Now add onion. Saute the onion in low to medium flame and in the meantime add the items under "To Grind" in mixer/blender and make it to a fine paste by adding little water. When the onion becomes translucent and golden(Caramelise the onion without burning it), add the ground paste to it. Saute the gravy until the raw smell of 'ginger garlic tomato' paste leaves. Now add the cleaned mushroom, mix it. Then add chilly powder, cumin coriander powder and salt and mix well. Saute the above gravy until the mushrooms are slightly sauted, say 5 mins. Now add water(Add 1.5 cups water or more than that as required) and boil the gravy until the mushrooms are cooked and the desired consistency of the gravy is reached. Then switch off the heat. Instead of Coriander cumin Powder, you can use 2 tbsp. cumin powder and 2 tbsp. coriander powder.